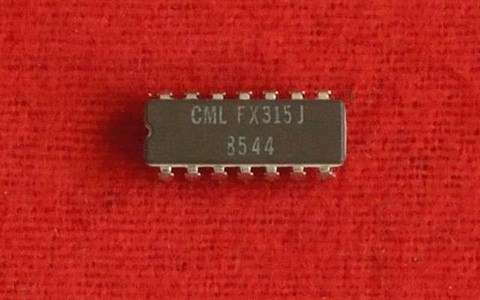 The FX315 is a monolithic CMOS integrated circuit tone encoder for sub-audio tone squelch systems. The tone frequencies are derived from an input reference frequency and an on-chip inverter is provided to drive an external crystal circuit. Tone selection is by a logic code at the D0-D5 programming inputs and two control inputs allow either a logic '1’ or logic ‘0' to enable the device. A low distortion sine wave is generated at the Tx Tone Output when the FX315 is activated. The emitter follower output stage can source 1mW directly into a 600 Ohm load. The FX315 is dedicated to continuous tone controlled squelch systems (CTCSS) in radio applications. It can, however, be used wherever encoding of low-frequency tones is required such as intercoms, door entry systems or industrial applications. The performance of a CTCSS system can be degraded if speech frequencies in the signalling spectrum are not removed before transmission. This can be achieved by filtering the microphone signals to attenuate frequencies below 250Hz. The FX315 requires a clock of 1MHz which is internally converted to logic level square waves. Consideration should, therefore, be given to possible interference problems with RF or IF circuitry caused by 1MHz or its harmonics. A decoupling capacitor should be used to smooth the supply rails. This will reduce the level of superimposed noise on the supply caused by internal switching transients (particularly at 1MHz and fo).